The interesting thing about this “news” bite is that Oprah just played her Al Gore show on climate warming this week. My wife was swayed by the show and I found myself explaining to my wife why I believe there is less certainty in the climate numbers than Al Gore portrays. I was not successful at getting to her to look at both sides of the question until I asked her to think about our local temperature records. Like most of the United States we are having some hot weather. This is likely the hottest week we have experienced here in the last ten years. You would think that with all of this global warming we would have been regularly setting record temperatures in the last ten years. Hmm… the weather man says the record was set in 1941 and the most recent high temperature for this day was 1998. Now we get this “news” bite that says “5 of the 10 warmest years on record now all occur before World War II”. Since the revised temperature graph no longer looks like a “hockey stick”, the link of global warming to human activity is much more tenuous. 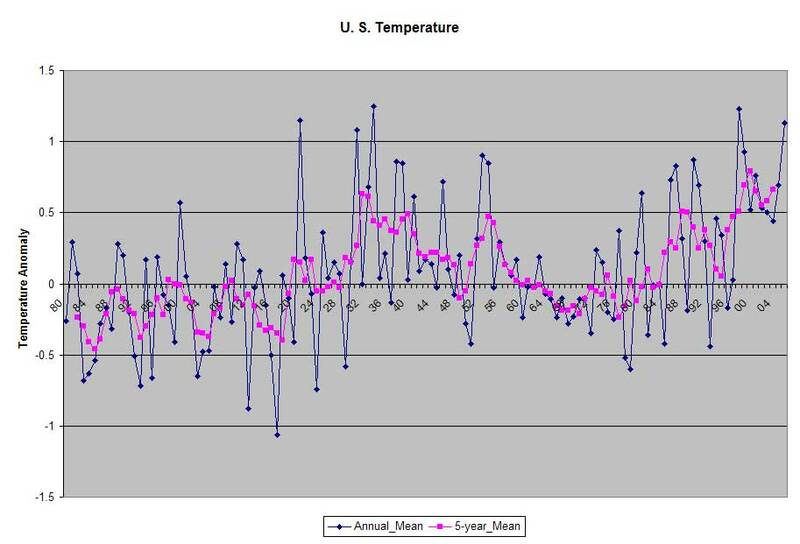 From the data it looks like there is a recent warming trend but there is a significant warming cycle in the 1930-1960 data. It will be hard to convince people to accept a dollar a gallon tax on gasoline to combat global warming with this data. Though the case for global warming is a bit weaker, we are once again reminded that climate science is a fuzzy science.